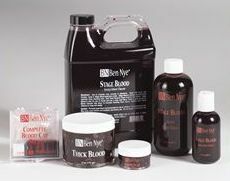 Many feature films have used this blood pack exclusively. Realistic qualities include vivid coloring and medium flowing viscosity. Peppermint-flavored and safe in mouth. May stain some fabrics and surfaces; test before use. (Expect 12-30 applications per ounce.) • 4 fl. oz./118 ml. Moist, jam-like texture can be used to fill wounds. "Scrape" along skin with a stipple sponge for an abrasion or road rash. Washable. (Expect 10-35 applications per ounce.) • 1 oz./28 gm.